Video: You Rock at The Alley Way Stamps! Back playing at The Alley Way Stamps blog today and it’s a real CAS masculine design today. This is an extra TAWS video for me today, due to a little technical (ahem) glitch, I’ve got two videos to share at the TAWS blog, so enjoy! You can find all these wonderful stamps at The Alley Way Stamps! < Previous Fabulous Flamingo times two! What a great card. Like the humor and the simplicity/clean style. 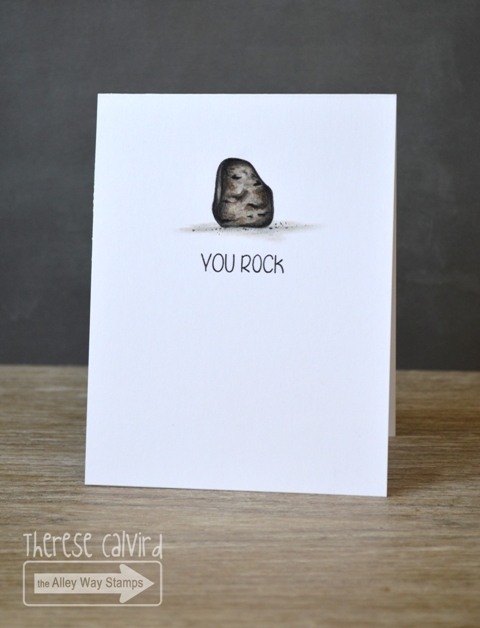 What a cute little one-layer card, Therese! Love that sentiment to go along with it…LOL. This is so me – I love it!! Gorgeous coloring on that rock!! I love how you added so much texture with your coloring, Therese! Fabulous OLC, and really perfect for a guy! Simple but cute, Therese. I love it and your coloring. Wow you’ve made that rock look so darn good! Such a cool masculine card!! I must keep this in mind as I have to make one next week and cards for men are not my specialty……. 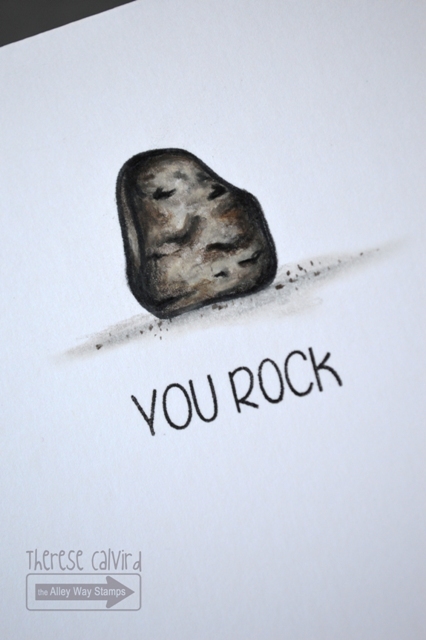 Thanks so much for the ‘rockin’ inspiration!! Wonderful masculine card! Love that rock! It couldn’t get much simpler than this! I love all the details in your rock.